Step 1 Cut the cabbage head half into half lengthways. Then halve again to give you 4 wedges. Step 2 Place the halves into a saucepan of water, bring to the boil, cover and simmer for 5 minutes. Step 3 Remove from the saucepan with a slotted spoon and place in a small baking dish. Step 4 Preheat the oven to 180C/350F degrees. Step 5 Melt the butter in a small saucepan and add the spring onions. Saute for 3-5 minutes until slightly tender. Step 6 Add the cream, mustard, seasoning, cream cheese and cheeses and gently stir until combined. Step 7 Pour the sauce over the cabbage wedges and bake in the oven for 20 minutes. 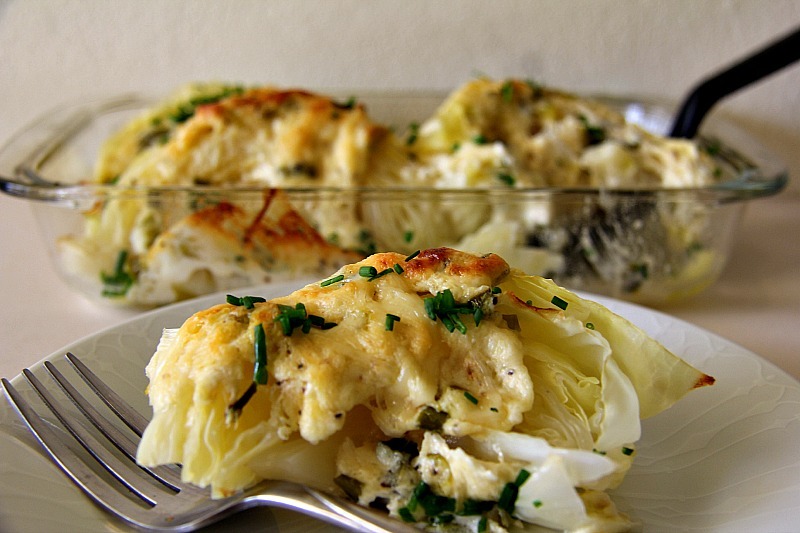 Cabbage wedges are covered with a cheese sauce and baked in the oven for a delicious cheesy cabbage casserole. An easy side dish recipe that is delicious and tasty.